The European Parliament today finalised its position on copyright reform. It voted to make nothing but cosmetic changes to the controversial plans for upload filters and a “link tax”. Today’s decision is a severe blow to the free and open internet. By endorsing new legal and technical limits on what we can post and share online, the European Parliament is putting corporate profits over freedom of speech and abandoning long-standing principles that made the internet what it is today. The adopted version of Article 11 (393 for, 279 against) allows only “individual words” of news articles to be reproduced for free, including in hyperlinks – closely following an existing German law. Five years after the ‘link tax’ came into force in Germany, no journalist or publisher has made an extra penny, startups in the news sector have had to shut down and courts have yet to clear up the legal uncertainty on exactly where to draw the line. The same quagmire will now repeat at the EU level – no argument has been made why it wouldn’t, apart from wishful thinking. The Parliament will now enter into final negotiations with the Council, representing the member state governments. Unfortunately, all the concerns by academics, experts and internet users that led to the text being rejected last July still stand. Unless filters are explicitly excluded in the negotiations, public protest will only increase and the entire Directive may well still be rejected when it comes up for a final vote right before next year’s European elections. Stay tuned for a comparison between the Council and Parliament positions on the controversial articles. Most of the people who voted + on this don’t know anything about how a PCs work. Hey Julia Reda. Do you know what you have failed for the September 12 vote? That on August 26, you haven’t managed to join many people (150-250 each city), Many people have relaxed too much with the rejection of July 5, which only pure political theater. You have had a much weaker campaign than in June and in July, that is why the groups in favor of the directive of articles 11 and 13, have had more successful campaigns, and then after accusing us of having spread “misinformation” (when they also misinform, even worse), the emails to ask not to vote the copyright directive as “spam” made by bots and “death threats” (the problem so that they look like “fake emails” was that all emails had almost the same prefabricated text, so we have to be more original to better express our concerns, but none has been a death threat) and that they don’t have consequences (they refuse to see the previous consequences, for them they do not exist, not even when it’s already too late). you are right, you only wrong in planning a campaign strategy that has finally gone wrong. For the final vote (Dec 2018 / Jan 2019) you must be more serious and convince and unite many people, you need a minimum of almost 100 millions of Europeans so that he can change his mind, because several of them voted against on July 5, actually wanted to vote for and the against vote was just an excuse to spend the holidays. Finally, you need a much more effective campaign against articles 3,11 & 13, a better strategy, and more attractive advertising that doesn’t make the indecisive ones seem like “misinformation”. Absolutely deplorable! It’s time to take action! That’s the end of the mainstream media then. A problem for everyone else though. Users, who post on social media, are not affected by Article 11. Social media services are absolutely affected by Article 11: So users who post there are of course too – yes, they don’t have to follow the law themselves, but the platform cannot allow them not to follow it. It said “noncommercial use of press publications by individual users”. What I assumed is, if you have a YouTube channel, and it’s not monetized, then it’s not affected, but if it is monetized, then it’s for-profit and it is affected. I’d argue that YouTube channels are never “noncommercial” and “by individual users”, since YouTube is a commercial entity. Any channel on the platform ultimately promotes their commercial services and thus, for them, serves a commercial purpose, whether directly monetized or not. A clear example of a “noncommercial use of a press publication by an individual user” would be in a video that you self-host on your own website. Of course, that would be up for courts to decide in a lengthy court case – until then we can’t say for sure. Is open source clearly defined here? I presume BSD and GPL-like licences would fall into that definition, but what about dual-licensed software? will the names of all who voted in favor be released? i wan’t to know if anybody from my local government endorses this. However AFAIK they just list the vote about the entire text, not the previous votes on individual parts, like the various options for Article 13. Some MEPs voted to make Articles 11 and 13 better, but when that failed, decided to vote for the result anyway. What are the chances, that this copywrong-decision can be stopped or reversed later on? Did the parliematarians understand what they were voting on, or was it just knejerk reactions that any criticism on the directive is merely a camouflaged campaigned by Google, and must thus be punished harshly? The chances are getting slimmer, but they’re not gone. There will be one final vote on the outcome of the negotiations between Council and Parliament which are starting now. That vote will be early next year. Will there be demonstrations the people of the world can attend? 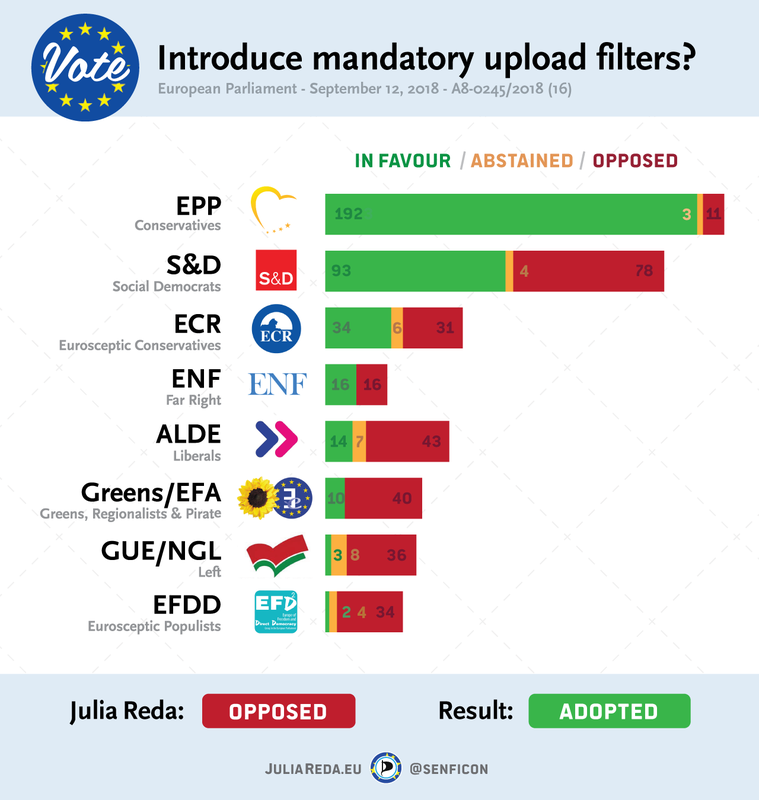 Hi Julia, I’m trying to find the list of people who voted for or against Article 11, but I can’t find it in the documents linked from http://www.europarl.europa.eu/plenary/en/votes.html?tab=votes . Was the vote for Article 11 not a rollcall vote? I was able to find the list of names for Article 13 on page 34 of the rollcall vote document. Unfortunately the vote on Article 11 was indeed not a roll-call vote. I already asked to the eu back in july to stop this from passing. Seems they didn’t care one bit, is there anything else we can do? There will be one final vote in the beginning of next year. EU elections are coming up in May: Make this a big issue in the election campaign – then we have a chance. I believe if you made a massive information campaign, showing all supporters of freedom with a green checkmark and all supporters of censor and ban to the freedom of speech with red X, you’ll have a great success for the vote in 2019 for new members of the European parliament. This is a sad day for the EU and the internet. Thanks for your diligent efforts today and in the past, trying to avert this, Julia Reda! 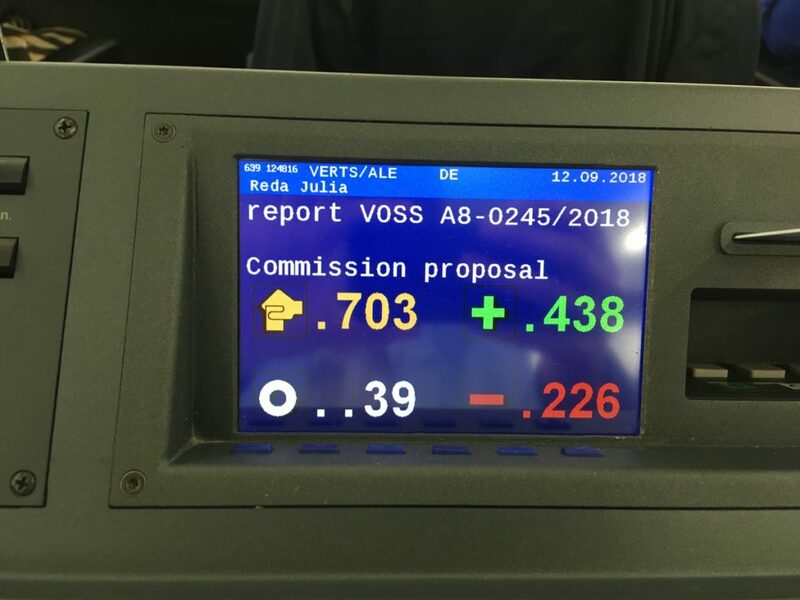 I’m not sure if this is the right place to ask, but how does one interpret the numbering/labelling of the amendments in the results of the votes (http://www.europarl.europa.eu/sides/getDoc.do?pubRef=-%2f%2fEP%2f%2fNONSGML%2bPV%2b20180912%2bRES-RCV%2bDOC%2bPDF%2bV0%2f%2fEN&language=EN)? but, if yes, what does 169=220 for instance mean? Yes, those should be the same numbers. 169=220 means that Amendment 169 was equal to Amendment 220 – the same text, filed by different people – so it was voted on together. It’s time to create a new Internet. I eagerly await more from you. I want to do the most I can to stop this! Articles 13 concerns Internet service provider- ISP? OCSSCP=ISP? (4b) ‘Online content sharing service provider’ means a provider of an information society service one of the main purposes of which is to store and give access to the public to a significant amount of copyright protected works or other protected subject-matter uploaded by its users, which the service optimises and promotes for profit making purposes. Microenterprises and small-sized enterprises within the meaning of Title I of the Annex to Commission Recommendation 2003/361/EC and services acting in a non-commercial purpose capacity such as online encyclopaedia, and providers of online services where the content is uploaded with the authorisation of all right holders concerned, such as educational or scientific repositories, shall not be considered online content sharing service providers within the meaning of this Directive. Providers of cloud services for individual use which do not provide direct access to the public, open source software developing platforms, and online market places whose main activity is online retail of physical goods, should not be considered online content sharing service providers within the meaning of this Directive. Can art. 11 & 13 be attacked the at EU Court at Luxembourg ? How big are the chances that the Court reject these new legal changes for breaking the EU treaties ? Some EU nations specify in their Constitution that censorship, in general, is forbidden. Maybe they can ignore the new EU regulations. Dear Julia, thanks for terrific work! Unfortunately you didn‘t report on the outcome of Article 3: Text and data mining. Article 3 might stop commercial “AI” applications on the Internet in the EU. Together with article 11 this would also possibly stop any commercial efforts for the development of an European search engine. At least risk capital for search-engine start-ups might cease completely. I guess we will be left in an even worse situation as with the German link text (aka Leistungsschutzrecht). In this respect maybe Brexit wasn’t such an bad idea after all – hey I never thought I would say that ;). This poses another serious question, namely would it be illegal to operate a commercial search engine from an non-EO country to index EU-pages? Or do I misinterprete the impact of articles 3 + article 11 on start-ups and small companies altogether? If Articles 11 and 13 were to go into law, then I have some concerns. First, Youtube. Will Youtube comply by either, (1) blocking “unlicensed material” from viewing only in EU countries, (2) blocking “unlicensed material” from viewing not only in EU countries, but also the rest of the world, or (3) strengthen their demonetization policy? Second, other social media sites like Facebook, Twitter, WordPress, Twitch, et cetera. Will they comply by at least geoblocking some of the content that contained “unlicensed material”, or worse, outright removal? Will other users across the world who use “unlicensed material” be affected, or will only EU users be affected? Will other users across the world still be able to upload content with copyrighted material (whether licensed or not) as normal? Or worse, will “outright removal” be the only option? If I, as a non-EU internet user, cannot be able to either view content that includes copyrighted material (especially videos or live streams, even if I’m outside the EU), post anything “fun” that includes copyrighted material (whether it’s audio, video, et cetera), or even post a status update (that includes even a single link, whether news, blog, et cetera) on social media, then my internet life will be COMPLETELY ruined. I am founder (and owner) of the biggest European search engine (founded in 1996). We are the only one European company that is able to succ compete with Google. With more than 80% market share on Czech Market, 3+ mil users a day and 1300 employees, I do believe that Seazam.cz can be a good use case in this matter as an affected party. Do you think this law will force more users and developers to flood the dark net and build onion sites? No new internet needs to be created, its already there. Is article 11 & 13 a restriction on all derived works? Perhaps they should be opposed because they want to prohibit all derived works; the EU would seem to have very lax fair use laws i.e. it’s not just meme’s and parodies, but reviews and commentaries and other value added products. Will the next vote be before or after Brexit if it happens, that would seemingly give you +18 votes. Do you know what corporations might have been behind the lobby to push this trough? Probably they will be the ones who will rule the “department of truth” censorship machine also? Is it possible to get voting results in a machine readable format, instead of PDF dumps?